Kite: A geometric figure formed by two perpendicular line segments, one of which is bisected by the other. Manipulative 1 - Kite Created with GeoGebra. A kite is a quadrilateral with two sets of adjacent, congruent sides. Click on the blue points in manipulative 1 and drag them to change the figure. The area of a kite is where p is the length of one diagonal and q is the length of the other diagonal. See manipulative 1. Opposite vertices of a kite are congruent. An incircle can be inscribed into any convex kite. One of the diagonals of a convex kite divides the kite into two isosceles triangles. The other diagonal of a convex kite divides the kite into two congruent triangles. 1 Start with a convex kite. 2 Construct the angular bisector of one of the angles connecting congruent sides. 3 Construct the angular bisector of one of the angles connecting non-congruent sides. 4 Label the intersection of bisectors from steps 2 and 3 as O. 5 Construct a line through O perpendicular to one of the sides. 6 Label the intersection of the line constructed in step 5 with the side to which it is perpendicular as P.
7 Construct a circle with center O and radius OP. This tessellation using kites is called a deltoidal trihexagonal tiling. To construct this tessellation, divide each hexagon into six kites by drawing a segment from the midpoint of each side to the center. Then tesselate the divided hexagon so that three hexagons share each vertex. A deltoidal icositetrahedron is a polyhedron whose faces are kites. Click to print a net of a deltoidal icositetrahedron to cut out and paste together. A deltoidal hexecontrahedron is a polyhedron whose faces are kites. McAdams, David E.. Kite . lifeisastoryproblem.com. Life is a Story Problem LLC. 8/7/2018. http://www.lifeisastoryproblem.com/explore/kite.html. McAdams, David E. Kite . 12/21/2018. All Math Words Encyclopedia. Life is a Story Problem LLC. http://www.allmathwords.org/en/k/kite.html. Deltoidal Hexecontrahedron: Maxim Razin, https://commons.wikimedia.org. This file is licensed under the Creative Commons Attribution-Share Alike 3.0 Unported license. https://commons.wikimedia.org/wiki/File:Deltoidalhexecontahedron.jpg. Deltoidal Icositetrahedron: Cyp, https://commons.wikimedia.org. This file is licensed under the Creative Commons Attribution-Share Alike 3.0 Unported license. https://commons.wikimedia.org/wiki/File:Deltoidalicositetrahedron.gif. Deltoidal Trihexagon Tiling: R. A. Nonenmacher, https://commons.wikimedia.org. Image licensed under GNU Free Documentation License. 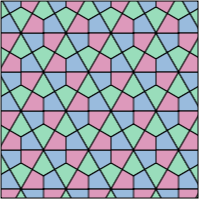 https://commons.wikimedia.org/wiki/File:Tiling_Dual_Semiregular_V3-4-6-4_Deltoidal_Trihexagonal.svg.